It’s rather typical of Brutal Truth that End Time, their second full-length since the reformation and fifth overall, is at once highly experimental and yet utterly what you’d expect from the band. To all intents and purposes a grindcore supergroup, the four-piece (including Rich Hoak, Dan Lilker, Kevin Sharp and Erik Burke) fill the nearly fifty-five minutes (!) with their usual raw chaotic flurry of grinding energy. Yet this is far from the usual grunt n’blast that most grindcore consists of, being quite experimental in sound and nature. Riffs are almost bendy, psychotically leftfield constructs that dance alongside the juddering rhythm section, which thanks to the mix often overwhelms the other instruments in a way that should annoy but instead weirdly enhances the experience, giving it a sheen of free-jazzy technicality. And Kevin Sharp is, as ever, one of the genre’s most underrated vocalists, his throaty gasps and howls helping to direct the deranged music and provides a wild-eyed showman for the circus of dementia that circles you throughout the album. So as ever, don’t listen to Brutal Truth expecting a whirlwind of headbanging. Do listen, however, if you enjoyed Evolution Through Revolution and want something even more out-there. The slowed-down Warm Embrace Of Poverty especially is a torturous crawl through territory normally blasted through at top speeds by grind, the impact coming from the sticky slowness of the harsh music. The twisted, obnoxiously weird Old World Order, the cascading insanity of Killing Planet Earth, the howling screeches of Gut-Check – each track is a different take on a world close to apocalypse in Brutal Truth’s eyes. Slow, crushing soundscapes such as Drink Up are as vital and valid an outpouring of bile as the faster, crazier tracks such as Twenty Bag. This is grindcore not as pure speed, but pure horror, a complete re-evaluation of the genre and what aspects of it make it so extreme. Melody and even a strange catchiness have a place here that other bands would find completely alien – it speaks volumes that Brutal Truth can absorb both into their unrelenting worldview. And it’s that, ultimately, which puts Brutal Truth up alongside Napalm Death as purveyors of harsh visions conveyed through music. Where Napalm are all about outrage at injustice, Brutal Truth depict the injustice in all its twisted glory; the two bands are at the very heights of grindcore and few come close. I hesitate to give End Time the highest of scores, because despite the praise above it does have certain faults. The unrelenting weirdness of it all can grate a little, and fifteen-minute closer Control Room could and should have been cut – feedback and backing percussive clatter beneath half-audible snatches of radio communication may be oddly effective to a nutjob like I, but on a grind album it’s one experiment too many. 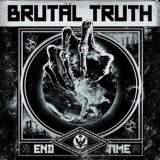 Credit where due, in Brutal Truth’s increasingly insane world it fits in perfectly, making End Time one of those creative slices of brutality that proves there’s life left in this ever-dying genre yet. One for the oddballs, from the oddballs.